Visitors wave flags in front of the official emblems of the Tokyo 2020 Olympics and Paralympic Games at Tokyo Metropolitan Plaza in Tokyo, Friday. 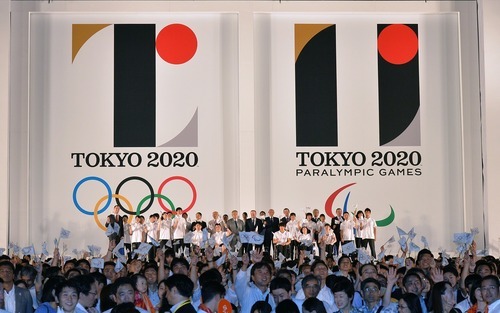 Organizers of the 2020 Tokyo Olympics revealed the emblem on Friday, JUL. 25, 2015, five years to the day before the opening ceremony. The emblem is based on “T,” standing for Tokyo, tomorrow, and team. It’s designed by Japanese artist Kenjiro Sato. The ceremony at Tokyo City Hall and was attended by Tokyo 2020 president Yoshiro Mori, Tokyo governor Yoichi Masuzoe, and IOC vice president John Coates. The games preparations have been bogged down lately by the controversy over a new National Stadium. After initially selecting a design by award-winning architect Zaha Hadid, the Japanese government scrapped those plans because costs pushed the price of the project to $2 billion.